Myself, my wife, and my very good friend were planning an overnight kayaking trip this past weekend but with potential heavy storms in the forecast, we changed our plan to a hike instead. This was the scene on our way to the trailhead. 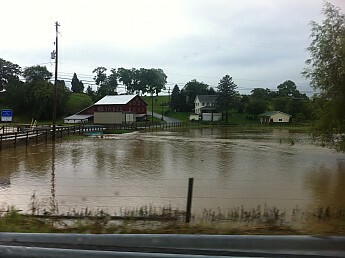 That "pond" was a field the night before. Good thing we didn't go kayaking like originally planned. 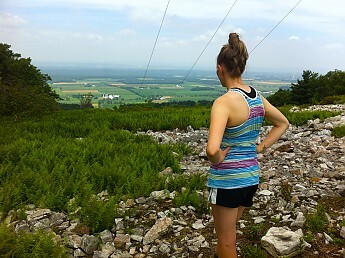 We decided we'd go to the same general area where we were planning to kayak and found a trail that we'd read and heard about, but never did much hiking on—Pennsylvania's Mid State Trail. 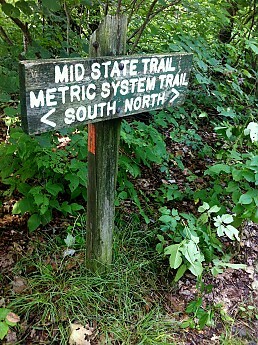 The MST is a 325-mile trail, or should I say, 523km trail (it's a metric trail, and claims to be the first major trail in the US to be laid out on the metric system) running north/south through central PA.
We borrowed a map (shout out to Purple Lizard Maps, they're fantastic! ), parked one car at the Jo Hays Vista near Pine Grove Mills, and drove to Spruce Creek where we would (after a stop at the local bakery) hit the trail and hike northward, taking two days to complete the ~15 mile ridge-top hike. 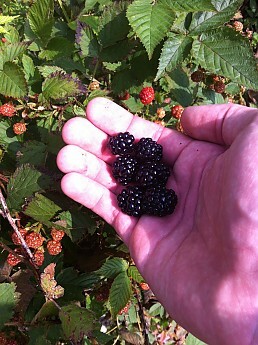 Not even five minutes on the trail, we came across a thick patch of wild blackberries and gorged ourselves. 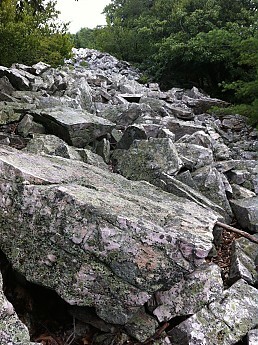 And then came the rocks. This wasn't near the trail, this WAS the trail. 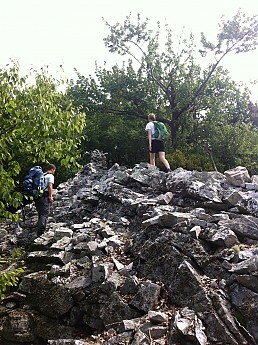 And with rocks and warm, sunny skies, we knew that meant potential snake encounters. 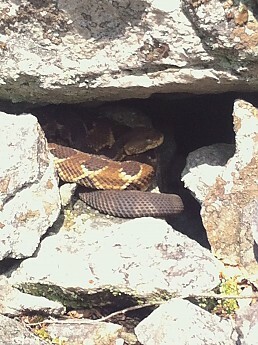 Timber rattlesnake. This one was certainly within striking distance before we saw it, but it didn't seem bothered by our presence. Only one of the four timber rattlesnakes we encountered was agitated enough to rattle, but it did so in plenty of time for us to respectfully get out of its way. 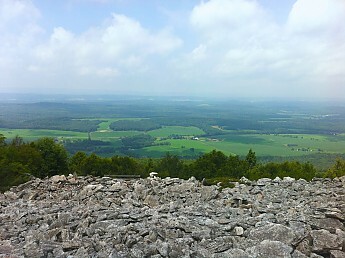 But we knew that hiking along the ridge among the snakes and rocks would, eventually, lead to clear vistas like this one. If you look closely, there is a bench at this vista. And this one...which was near the end at the power line and a great place to drop the packs and enjoy the scenery (even if it was distorted by the power cables). In all, we were glad we decided to hike instead of kayak, but didn't expect this section of trail to be so unbelievably rocky. 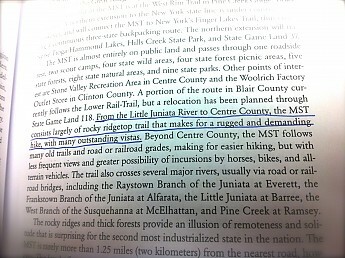 When I got home, I re-read a guidebook of mine and somehow missed this part (I underlined it after the hike). All forums: Older: We're Giving a Gear Reviewer an Elie Kayak and Paddle Newer: Can analogies be drawn between hunting phases and other outdoor activities?